You are here: Home › Events › Join SRLP’s celebration of Sylvia Rivera’s and Marsha P. Johnson’s birthdays! 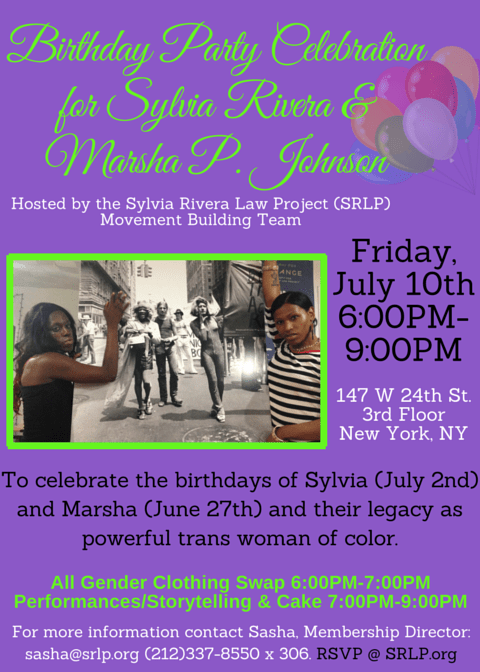 On Friday, July 10th from 6:00-9:00PM at the Audre Lorde Project, 147 W 24th St. 3rd Floor, New York, SRLP will be celebrating the birthdays of Sylvia Rivera and Marsha P. Johnson and honoring their legacy. There will be an all gender clothing swap, performances and storytelling by community members, and cake! This party is brought to you by the Movement Building Team at SRLP. For more information, contact Sasha, Director of Membership, at mbt [at] srlp.org or call (212)337-8550 x 306.